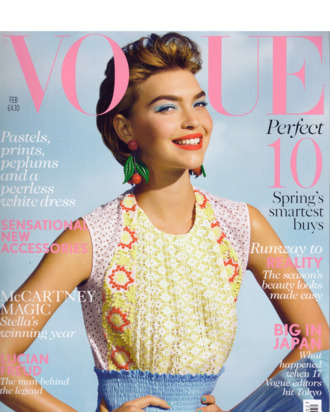 Arizona Muse; British Vogue February 2012. With her new hair backcombed, and her now-signature “say cheese” smile, Arizona Muse covers February’s issue of British Vogue. She’s wearing spring 2012 Prada paired with bright makeup, nail polish, and large cherry earrings.